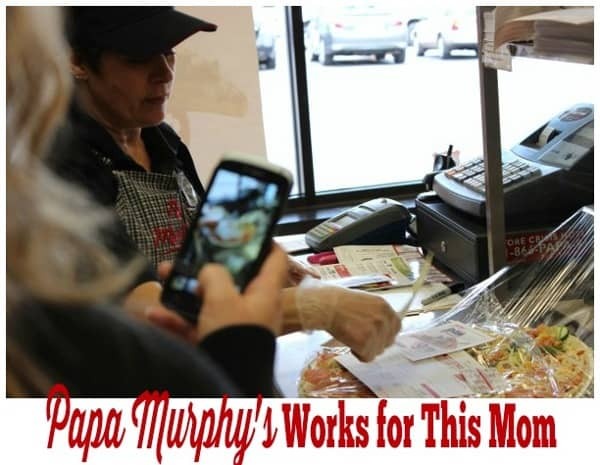 I was given a really cool opportunity earlier this week to participate in a ‘behind the counter’ tour of Papa Murphy’s in Frederick, Maryland. 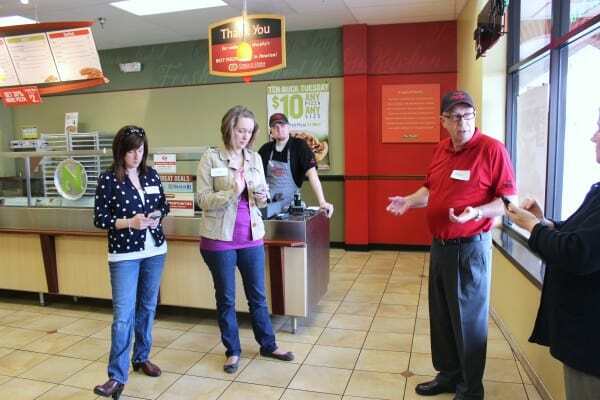 I had heard of Papa Murphy’s before in of all places, a Weight Watchers meeting. But before this day, I had never been to a Papa Murphy’s. 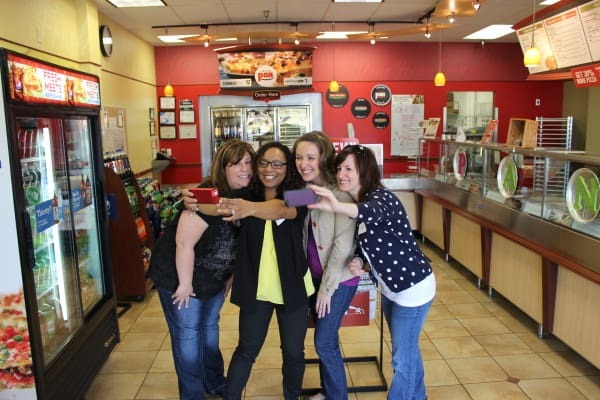 The idea behind this ‘behind the counter’ tour was to invite a select group of moms, specifically mom bloggers, to come in and see what Papa Murphy’s is all about. This was my chance to finally get a firsthand experience of Papa Murphy’s. There were 7 mom bloggers, including me with our cameras and phones, ready to hear the spiel. 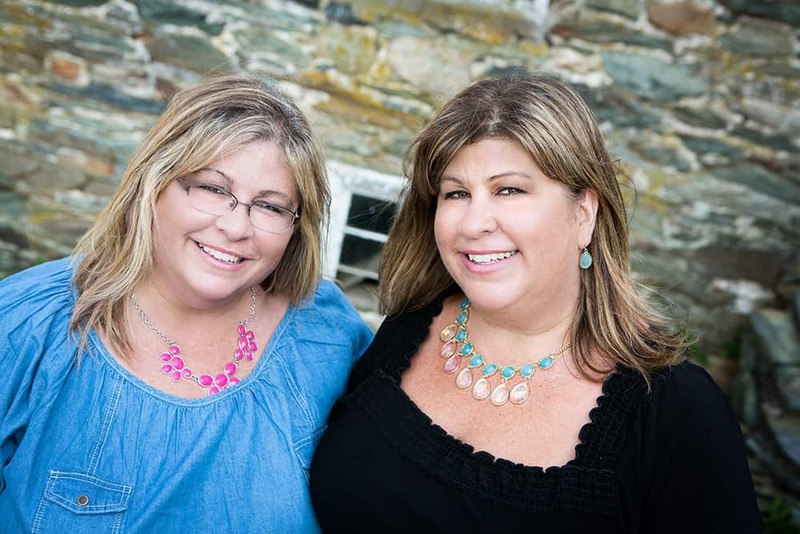 We were met by the owners of the Frederick franchise, Mark & Tammy Bomberger, a super nice married couple who admittedly are able to work together and still like each other at the end of the day. 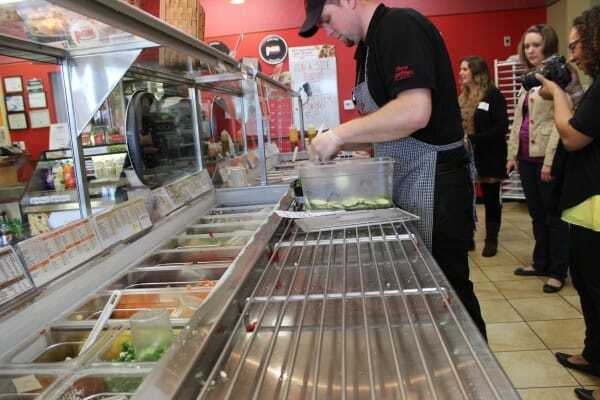 Their son-in-law Travis helps to run the Frederick location, as well as their 2 other locations in Hagerstown, Maryland. 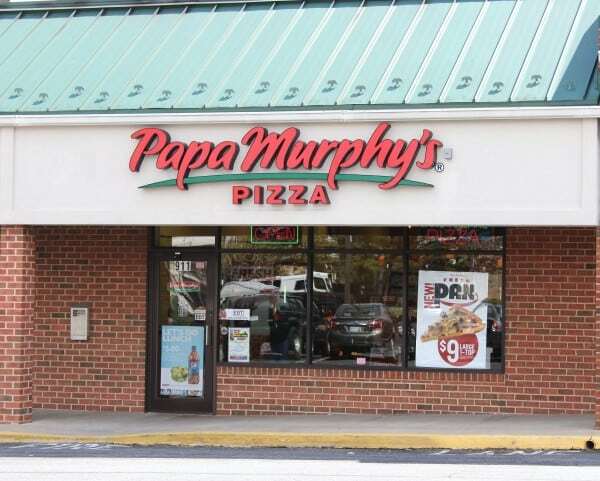 Mark told us that their Frederick Papa Murphy’s location was the first one in all of Maryland. They opened their doors in 2010. 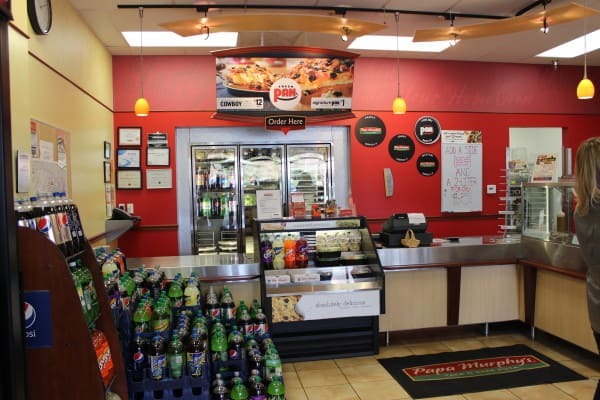 Mark is a former big wig at Taco Bell and had retired, but he loved the Papa Murphy’s franchise concept so much that he and Tammy decided to take the leap. And they haven’t looked back. You can see in their faces and their enthusiasm how much they love what they do. 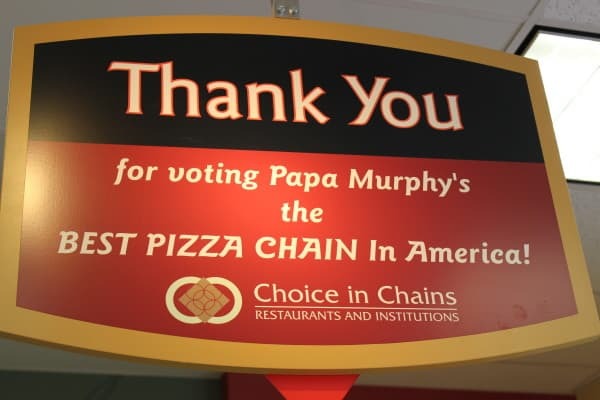 Papa Murphy’s offers something for everyone. 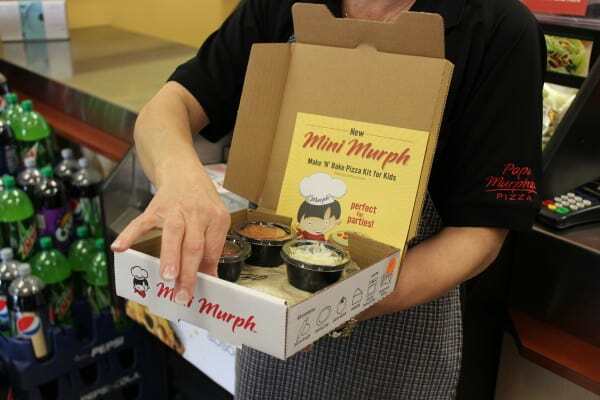 Their Mini Murph Make ‘N Bake Pizza Kits for Kids are the perfect choice for the little ones in your life. I know from my experience with my son, whenever we go out to eat and there’s a make-your-own pizza on the menu, that’s what he goes for. All of the mom bloggers oooohed and aaahhhhed over the kids kit. 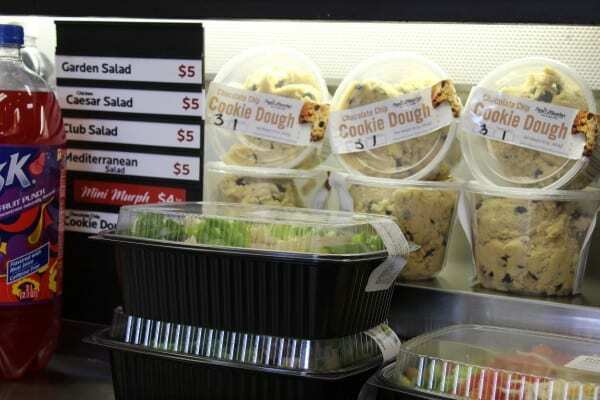 Also, pre-made are delicious, fresh salads and tubs of cookie dough. Yes, you read that correctly. They.sell.tubs.of.cookie.dough! This would be entirely too dangerous for me because I can see me now sitting down with the tub and a spoon and hiding the evidence afterwards. The good thing about the cookie dough is that it is made fresh with pasteurized eggs, so it is totally safe to take home and bake (or eat out of the tub). 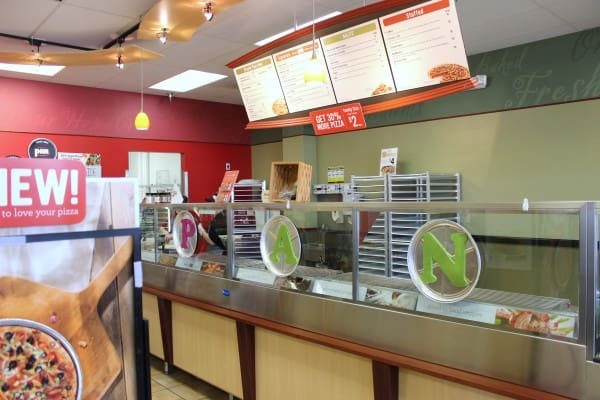 One of my first impressions of the Frederick Papa Murphy’s was how clean it was. Everything had its place and was very neat and orderly. That says a lot when you walk into an establishment that sells food. 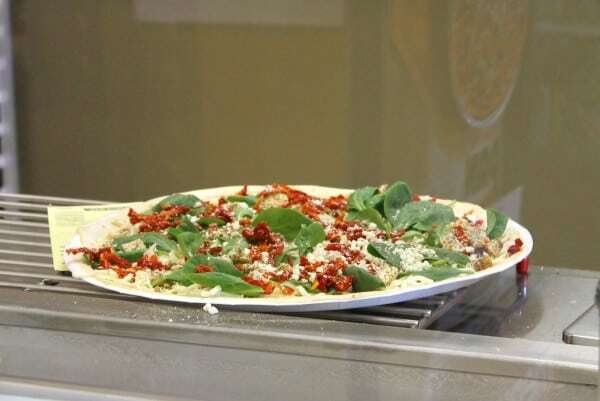 The menu is clearly displayed and gives you many choices of Create Your Own Pizzas, Signature Pizzas, their deLITE choices, and their Stuffed Pizzas. 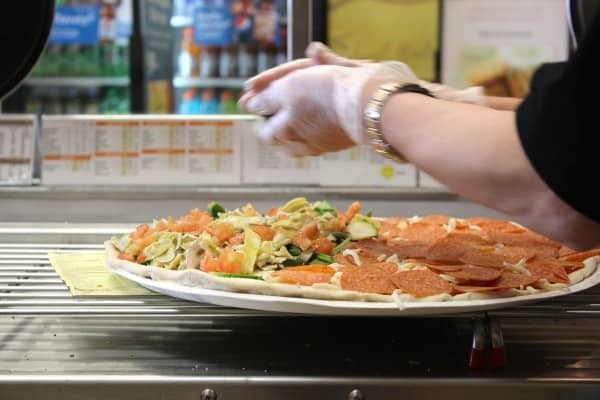 But don’t worry, if there’s not a specific pizza on the menu that you have to have, they will customize your pizza to your exact specifications. Tammy told us one of their mottos is ‘We can do it’. 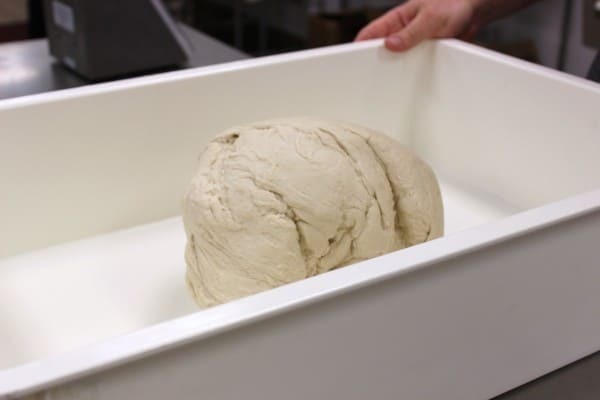 Being able to see the behind-the-scenes action made me even more impressed with the Papa Murphy’s end product. 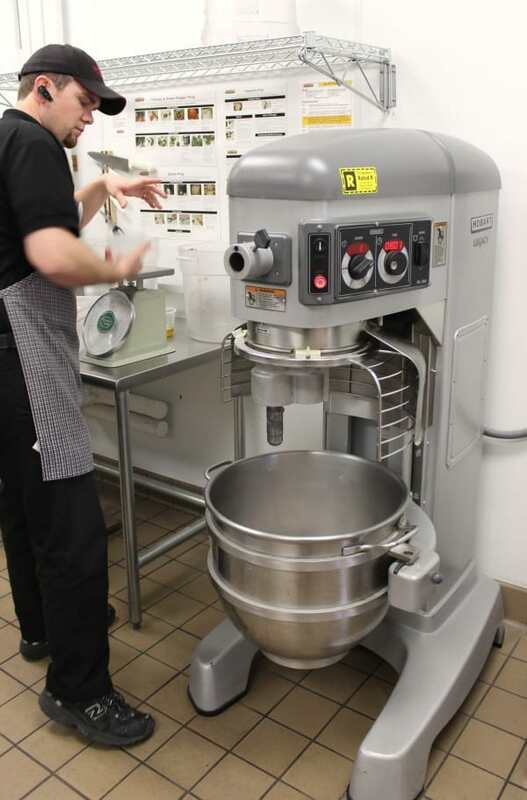 Travis showed us their dough machine, which also slices mushrooms and performs other duties. 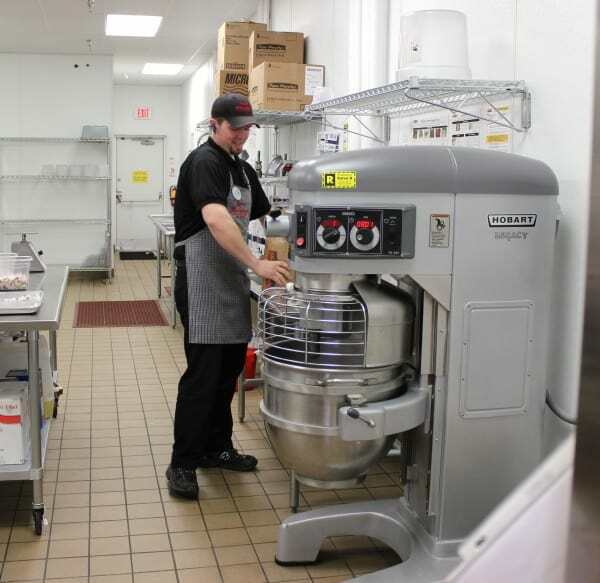 Employees must adhere to exact measurements of ingredients to prepare their different types of dough. 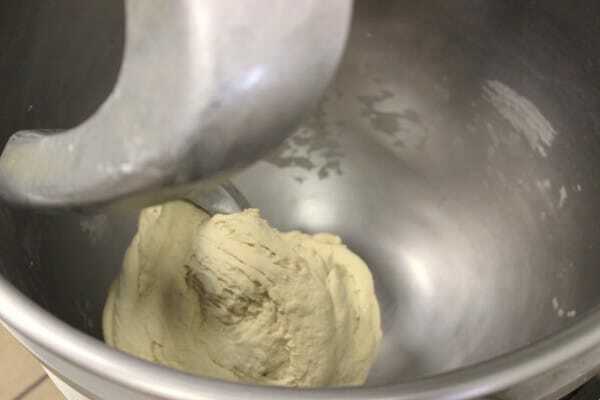 After the dough is blended, it needs to be balled up, sit at room temperature for a specific amount of time, then it gets chilled in the walk-in cooler and then when it is ready to be shot through their shooter, it needs to be warmed up again. 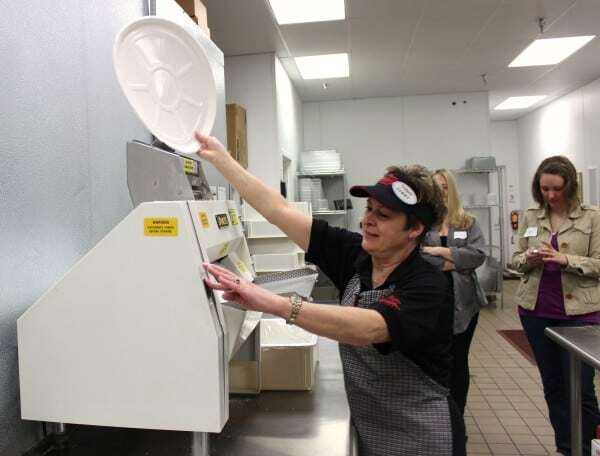 Once the dough is ready to go, it gets shot through the dough sheeter, pictured below. 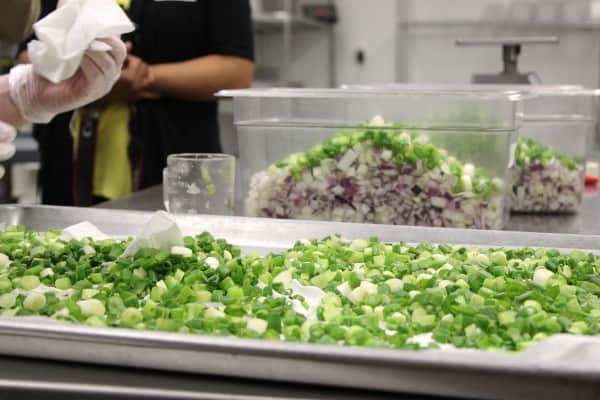 Many of their ingredients are hand chopped and stored in their walk-in cooler. You can’t get any fresher than that! 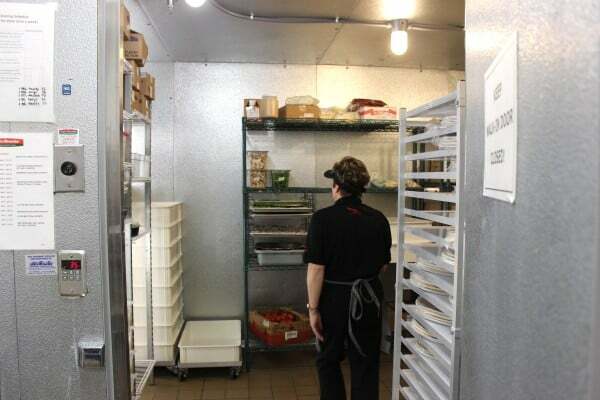 Tammy showed us the inside of the walk in cooler – Brrrr! 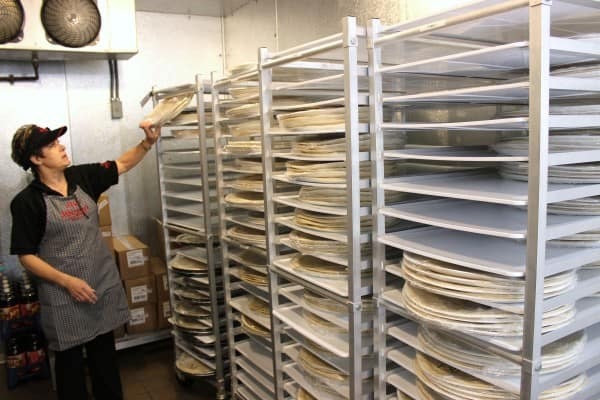 Lined up on racks were all of their different types of pizza dough that had already been shot through the shooter and placed onto their teflon, ready-for-the-oven trays. They offer the thin deLITE crust, the original crust, and the stuffed crust. The tour was not over yet! We went back even further in the store to see their dry ingredients, which included their sliced olives (can you imagine them having to slice their own olives? 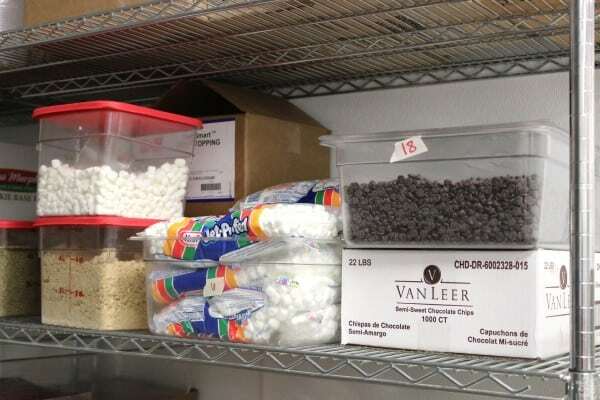 ), their marshmallows and chocolate chips. Marshmallows and chocolate chips? Why yes! Because…….. 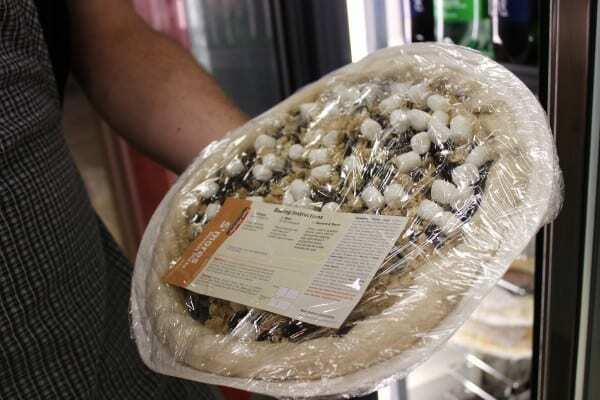 They make a to-die-for S’mores Dessert Pizza! 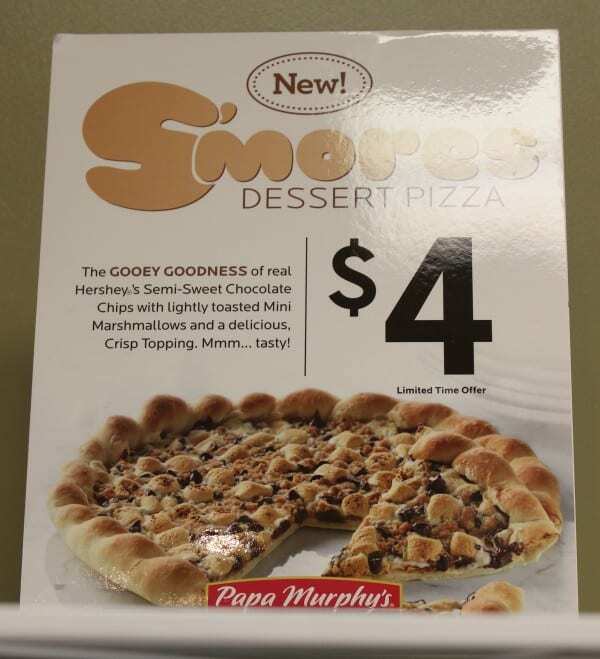 There are even chocolate chips embedded in the outer crust of the pizza. Also included among their dessert offerings is a Cinnamon Wheel. Travis and Mark told us they both like to make this to serve for breakfast, but it can also be served as a dessert. Yum! Further back into the store was the office, which had their washer and dryer and all of the employee’s uniforms. All of us mom bloggers were very impressed with the fact that employees are not to bring their uniforms home to wash. All uniforms are washed on the premises. 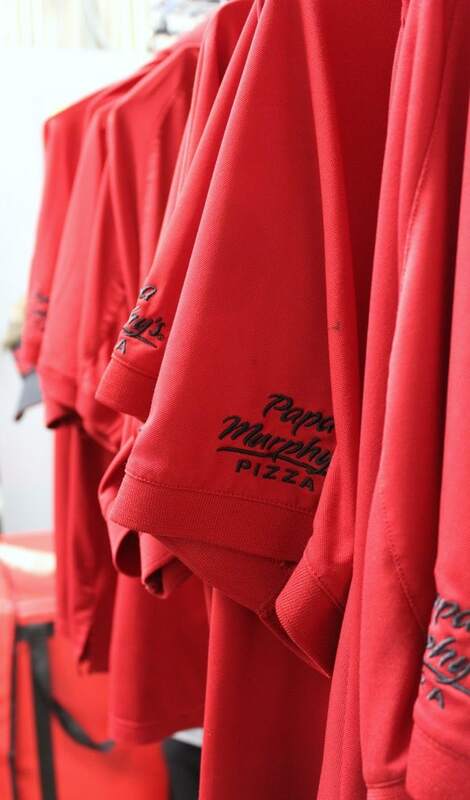 Makes for peace of mind that everything is clean to Papa Murphy’s standards. The last leg of our tour was to actually watch the pizzas being prepared. 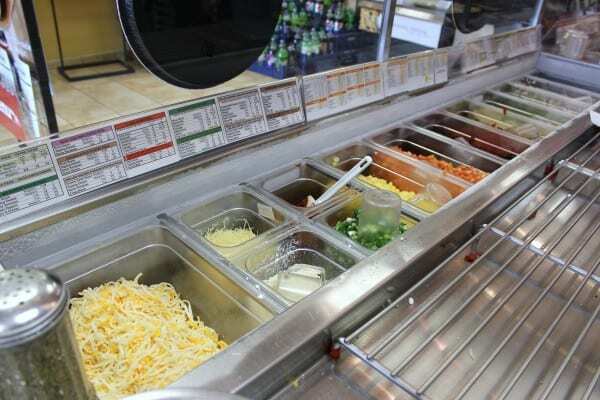 Keep in mind, this is not like a Subway where you walk in and tell the person behind the counter what you want on your pizza as you walk down the line. 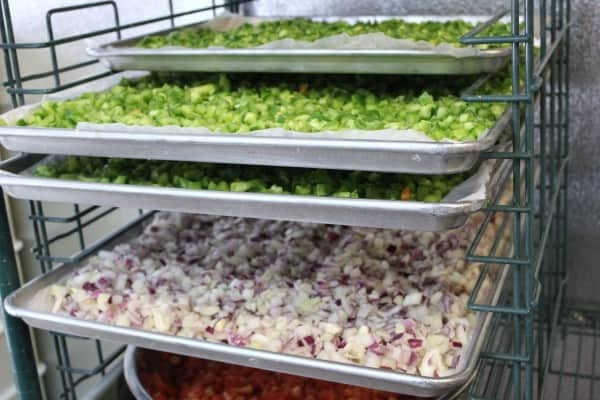 You simply walk up to the counter, tell them what you want, and within 3 minutes your pizza is made, packaged, and ready to bring home to bake whenever you’re ready to eat it. All of the meat toppings are pre-cooked. 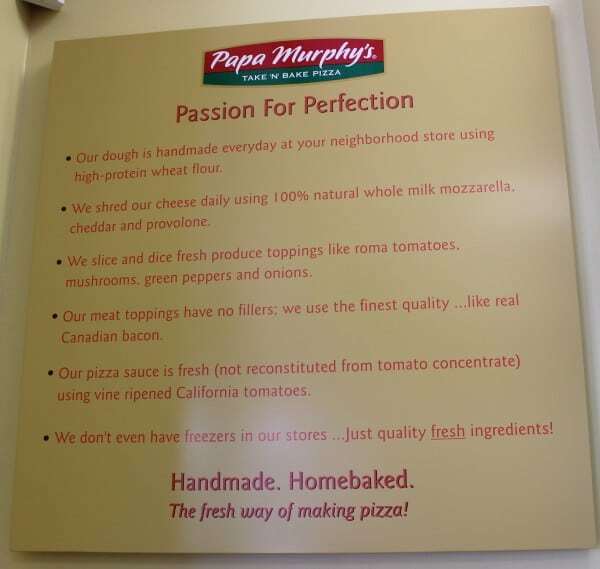 Papa Murphy’s takes pride in the fact that their pizzas are fresh and very tasty. This pizza that Tammy was making looked so good that I ordered one to take home with me. 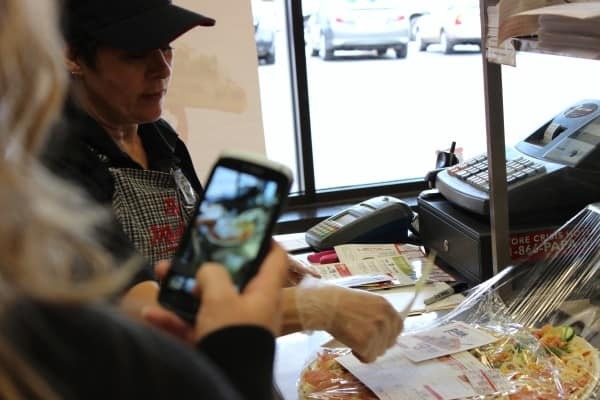 Here is Tammy packaging up the final product along with instructions as to how to bake it, a menu, and a coupon for your next visit. Tammy & Mark told us that their busiest days are Tuesdays and Fridays. 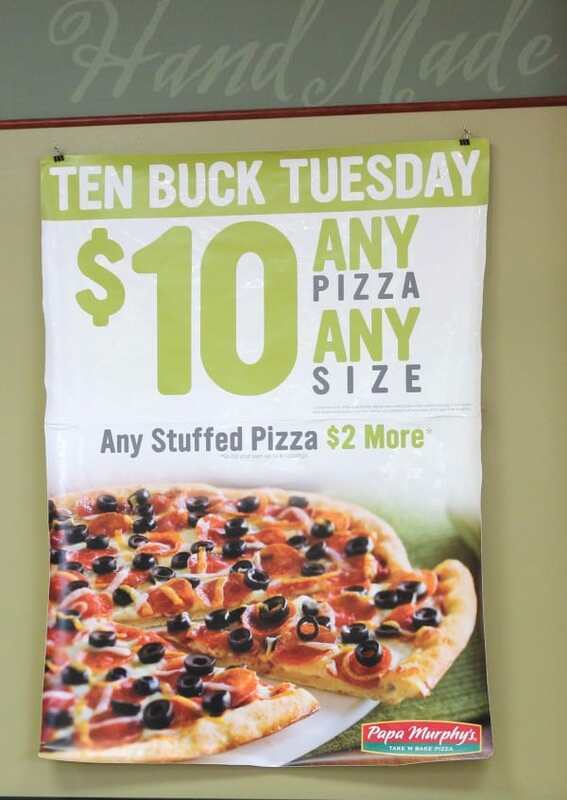 Ten Buck Tuesday is a popular day at Papa Murphy’s. 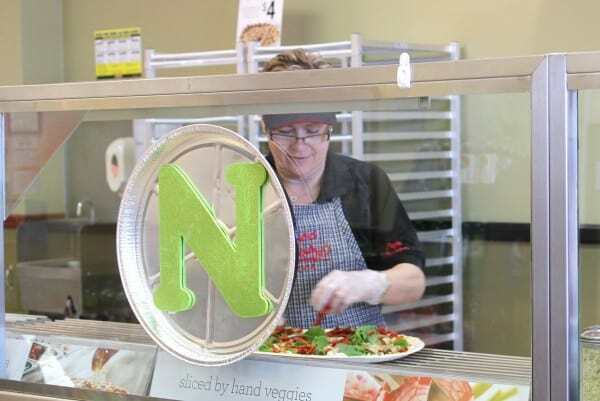 Tammy told us that Papa Murphy’s also gets involved in fundraisers, events, and group tours. 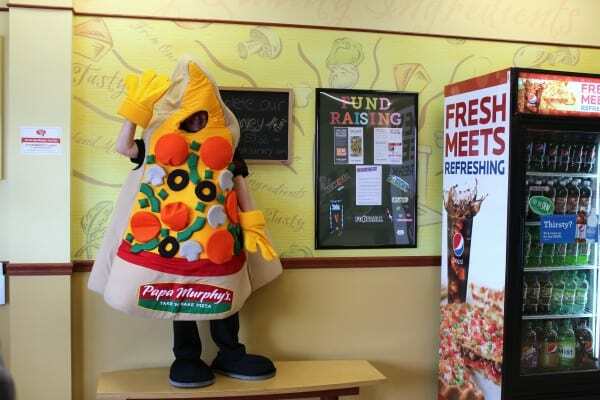 She even modeled for us their Papa Murphy’s pizza slice costume, which is a total hit with the kids. Go Tammy! And we couldn’t end a blogger event without a group selfie, because, yeah, that’s what bloggers do. 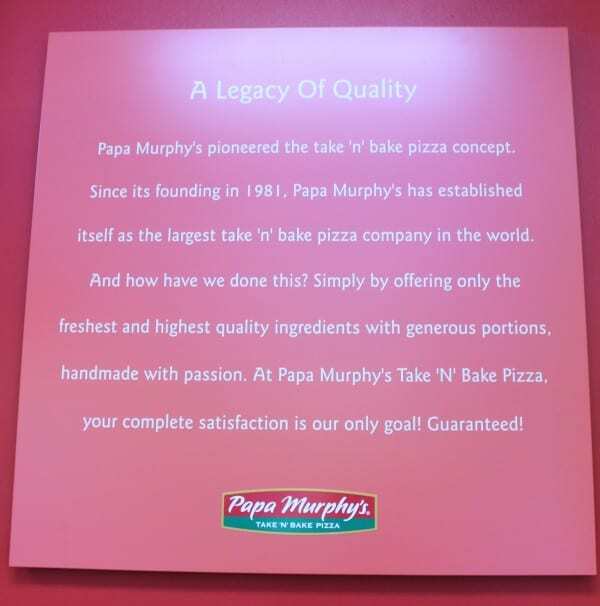 So if you’ve never been to Papa Murphy’s and keep telling yourself, I need to check it out, really, go check it out. I brought home 3 different pizzas. I know, it’s probably not very Weight Watchers friendly. Although, they do have nutrition information brochures in the front of their store, so you can walk up to the counter and make an educated decision. Every pizza I brought home was enjoyed thoroughly by my family. And being a mom who, like most moms, doesn’t always have time to prepare a dinner, Papa Murphy’s pizzas are the next best thing. It wasn’t a delivery pizza with grease soaked through the box. 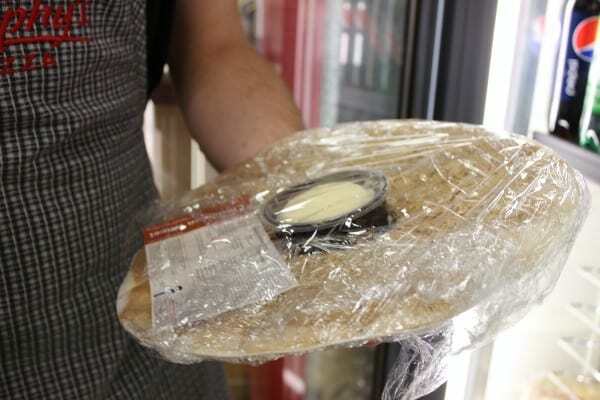 It was a freshly made pizza made-to-order and ready to bake in your own home. 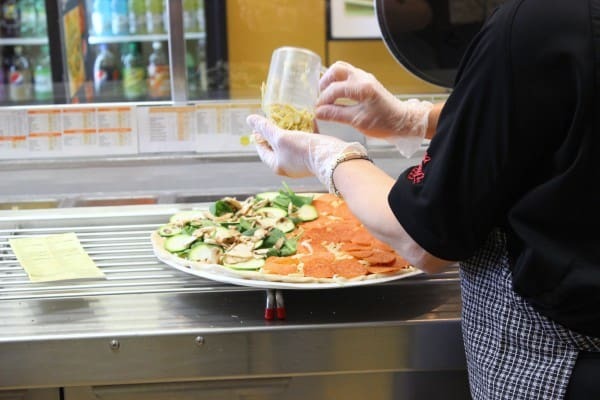 The Papa Murphy’s concept is very simple – to make you, the customer, fresh, ready-to-bake pizzas that can be baked whenever you’re ready to eat it in the comfort of your own home. Genius! Loved your review. Just a note: it’s called a “sheeter” not a “shooter.” The dough is flattened (“sheeted”) twice and then fit to the pan. And it’s hard work! Thank you Sue! And thank you for that correction. I will change it in my post.